UNREAL DEAL! 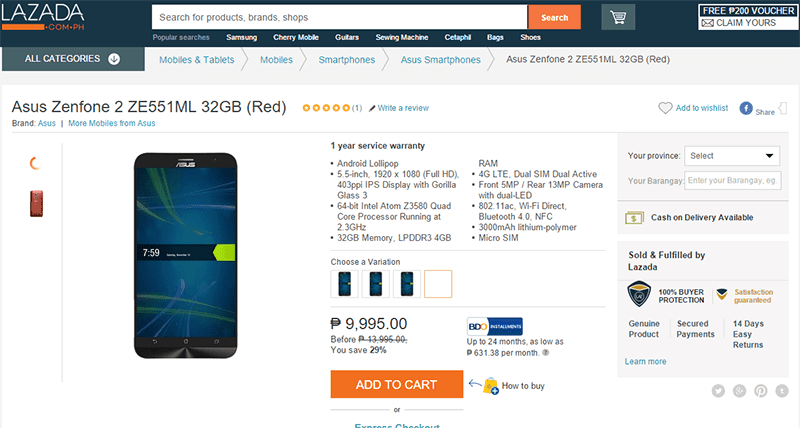 Asus ZenFone 2 ZE551ML With 4 GB RAM And 32 GB ROM On Sale For 9995 Pesos Only! Home / asus / mobile / news / UNREAL DEAL! Asus ZenFone 2 ZE551ML With 4 GB RAM And 32 GB ROM On Sale For 9995 Pesos Only! Don't miss this opportunity! Recently, we just got a tip that the Asus ZenFone 2 ZE551ML with 4 GB RAM and 32 GB ROM is currently on a huge sale at Lazada Philippines. ZenFone 2 for 9995 Pesos only! In case you missed it the Asus ZenFone 2 is one of the few devices in the country today that has 4 GB of RAM. Even up to this date, this handset still boast one of the most capable configuration that's designed to run almost any type of application. From the original price of 13,995 Pesos, the ZenFone 2 ZE551ML with 32 GB ROM now retails at just 9995 Pesos. A phone that affordable with 4 GB RAM and close to high end features and performance is definitely hard to ignore. Update: I got a word from Asus Philippines that they're not officially carrying this product. This sale only applies for Lazada Philippines.